In the final sequence of Mohamed Malas’ debut feature Dreams of the City – which he completed in 1984 – groups of men and women in Damascus celebrate the 1958 unity between Egypt and Syria. In elation, they dance and ululate, while pictures of Gamal Abdel-Nasser cover the streets. 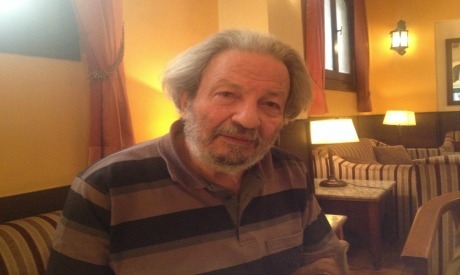 Today, because of difficulties in obtaining an entry visa, Malas barely made it to Cairo for the retrospective of his films hosted by art house cinema initiative Zawya in Cinema Odeon between 8 and 11 May. Malas, however, does not seem overly upset about the obstacles he encountered. The way he sees it, the restrictions imposed on Syrians trying to enter Egypt are only temporary. "It is merely a reflection of how things are in both countries right now; the situation in Syria isn’t normal or stable, nor is it in Egypt," he says, "but this current tension won’t last. The ties that bind our people are way stronger, and they shall persist." Malas, an outspoken dissident of Bashar Al-Assad’s regime long before Syria’s 2011 uprising, follows the events engulfing his country with a mixture of sorrow and resilience. He continues to live in Damascus, despite increasing dangers and stifling restrictions on artists. "But cinema has always suffered in Syria, even before the outbreak of the current events," Malas says. "The state has always enjoyed a complete monopoly of film production and distribution, which compromises the honesty and the freedom with which films are made. Even now, after everything that’s happened, this is still the case." After what he calls a "tiresome experience" with Syria’s General Organisation for Cinema, Malas resorted to alternative methods of bringing his films to the light, seeking funds and independent production. "Even when independently produced, films still have to be approved by censors, though, but that doesn’t really matter." Elaborating, he continues, "It doesn’t really make a difference whether your film is released in Syria or not, because people no longer go to the movies anyway. The theatres are in poor condition, the projectors are in bad shape; the sound and image quality of the films shown is often disastrous." Faced with an ailing industry, Malas is still driven by a burning passion to make films, but a passion stemming from his own personal stories and the desire to tell them. His cinema heavily bears the imprint of his childhood and adolescence, with the personal and the political invariably intertwined in his work. When listing his influences, Malas never fails to mention Igor Talankin, his mentor and teacher at Moscow’s Gerasimov Institute of Cinematography, from which he graduated in 1974. "I learned so much from him, but he always told me: 'The only thing I taught you is how to know yourself'," Malas remembers, "and that, to me, is what cinema is all about; knowing yourself and expressing it." In Malas’ eyes, cinema is powerful enough to re-imagine history, to recreate it for those who were not there to see. "I’ve experienced things and places that are no longer there, no longer visually accessible; but in my head they are so vivid and I want to share them with the world. As a filmmaker, I see this as a responsibility; a calling." This, precisely, is what Malas sought to achieve with his renowned trilogy, beginning with Dreams of the City in 1984 and ending with last year’s Ladder to Damascus, where he attempts to chronicle the last 50 years of modern Syrian history. In Dreams of the City, a coming of age drama that is indisputably autobiographical, a traumatised family moves from the destroyed village of Quneitra -- Malas’ birthplace -- to the urban whirlwind that is Damascus. There, the young boy Adib (the director's alter-ego), simultaneously begins to discover himself as well as the capital he inhabits. The Night, the second instalment in Malas’ trilogy, made in 1992 but never released in Syria until 1997, is the ultimate manifestation of the iconic filmmaker’s obsession with his ‘home’; Quneitra. Part of the still-occupied Golan Heights, the village was bombarded beyond recognition by Israeli forces. In the film, Malas brings Quneitra back to life through a young man searching for answers about the life of his rebellious father, who inhabited the village in the 1930s and 1940s. "The occupation destroyed the village; but cinema managed to rebuild it," Malas muses. The third and final film in Malas’ trilogy, Ladder to Damascus, is the only one that is not autobiographical, yet it still reflects characteristic elements of the auteur, namely his love for cinema. The protagonist, Fouad, is a struggling director who lives with a group of young people from all over Syria in a small establishment housing artists and creative individuals as the revolution rages on the streets. "It seemed natural and appropriate to end the trilogy with a film exploring the present moment in Syria, after revisiting the past with the first two," Malas says. Filming in Damascus during the peak of the violence devouring the country, Malas was fully aware of the difficulties involved in making Ladder to Damascus. To evade interferences by the state and ensure the safety of his crew, he restructured his script so the film would take place almost completely indoors. Yet making a film about the ongoing situation in Syria was challenging in more ways than one. Works of art that revolve around events of historical magnitude and are made while such events are still unfolding prove irreconcilably tricky, and often come off flat, limited and short-sighted. On how he managed to avoid falling into that trap, Malas says, "I wasn’t really trying to politically analyse the situation or predict how it would evolve. I merely wanted to reflect what was happening, to capture the hope and uncertainty it stirred, and to convey its effect on the characters." In Ladder to Damascus, Malas wanted his characters to be a representation of the Syria he and so many others like him desired: free, diverse and inclusive. To pull that off, he chose amateurs for the lead roles rather than professional actors and gave the characters their real names. "There was a dialogue between them and me -- a free flow of ideas that created people on screen who were a mixture of their real personalities and the characters I had initially written to convey my own vision." Throughout Ladder to Damascus, clips from other works of cinema are incorporated into the film and tributes are paid to other directors, most notably the late master of Greek cinema, Theo Angelopoulos. "I particularly included Angelopoulos because he had died in a tragic accident only weeks before we started shooting, and I wanted to pay homage to that great filmmaker who has profoundly influenced my work," Malas says, "but, most importantly, I chose Angelopoulos because his work is often centred around exile and return, and this is what I want for my people who were forced to leave their country over the past three years: to come home." For Malas himself, however, leaving Syria is not an option – so far, at least. "If I leave the country now I will be doing it as a refugee, and I refuse to live the few remaining years of my life as one," he asserts, "I want to stay in my city; even if it’s no longer safe." For someone whose cinema is as personal and as place-centred as Malas, staying in Damascus is also a matter of artistic survival, although it puts his actual life at risk. "I cannot make films outside of Syria, my work is bound too tightly to the land," he explains. "I stayed and managed to make Ladder to Damascus, and it would’ve never come out the way it did had it been filmed somewhere else. I don’t really know if it’s possible to make that happen again, but I know I’d rather try than leave."